Trixie? Take a letter will you please? The aging and congested multimodal transportation network of the Northeast region is facing a crisis. Sort of. Rudimentary and poorly executed straight-line extrapolations still must be tortured significantly to show an expected increase in population, estimated to take almost 40 years to grow by 30% from roughly 50 million residents today to 65 million in 2050. Though this provides ample opportunity for scare-mongering among like-minded advocates of passenger rail transport, it fools almost no one else. While significant and necessary efforts are underway to optimize and improve the current transportation system, the future of Northeast region – America’s economic powerhouse and political capital – requires moving beyond mere preservation and rehabilitation to a new vision for expanded transportation capacity and growth in budget and unionized labor forces. The Amtrak Northeast Corridor (NEC) is a vital component of today’s unionized regional transportation network and we’ve been doing our part to envision how the NEC can support the region’s labor growth and continued worker prosperity. Simply put, we believe that the NEC budgets must be improved to accommodate more trains, operating at faster speeds with significantly reduced trip-times, and with improved service reliability to key points of presence in order to meet or modify the political, long-term mobility, and economic development needs of the region. This summary document, The Revised Amtrak Vision for the Northeast Corridor: 2012 Update Report, outlines proposed programs along with recent actions and initiatives taken by Amtrak and others since the release of two major planning efforts in 2010, The Northeast Corridor Infrastructure Master Plan and A Vision for High-Speed Rail in the Northeast Corridor which have been integrated into a single coherent service and investment program, called the NEC Capital Investment Program, which would advance critically needed near-term Master Plan projects benefiting the existing NEC while developing a dedicated, next-generation NEC high-speed rail system through incremental “Stair-Step” phasing improvements to our current Acela Express high-speed service which would incorporate findings from the recently completed NEC Business & Financial Plan that will help guide Amtrak thinking on how to potentially fund, finance and deliver this bold vision for the NEC with new ridership and revenue projections affirming the excellent markets and huge opportunities for high-speed rail in the region and new concepts for managing capital expenditures to ensure a manageable and fundable program. Uh, Linda? Bring me another Bushmills, and make it a double this time. Of the utmost importance, Amtrak will use information gleaned from the latest federal environmental analysis and planning process to define the development of the NEC for the next 30 years. Led by the Federal Railroad Administration, the NEC FUTURE - Passenger Rail Corridor Investment Plan is a critical step in the planning process that will determine the overall scope and approach for future rail services and political capital for the entire Corridor. Nationalize the freight rail system. This approach also has the added political benefit of removing the "American Rail was designed to haul freight" argument from the arena whenever we try to ram high speed rail projects though. Some executives like to boast that Amtrak has more than 20,000 employees with approximately 85% of the Company’s labor force covered by labor agreements. This betrays a severely backwards approach to the issue. These figures actually represent in excess of 3,500 non-unionized employees. We intend to correct this figure immediately. Immediately lay a Rust Belt line connecting Scranton to Rochester, Utica, Gary Indiana, Green Bay and Detroit, immediately injecting these areas with much needed life. Recently our plans to expand service and boost employment figures by running a ten (10) mile tunnel under an alluvial floodplain and below the entire county of Philadelphia between the Frankford Junction and the Philadelphia Airport have drawn some criticism. The most frequently cited critique is that the project is far more costly on a per-mile basis than any other line in the world. One critic has gone so far to suggest that the project would be more than twice as expensive as the 35 mile long Gotthard Base Tunnel through the Swiss Alps on a per mile basis. 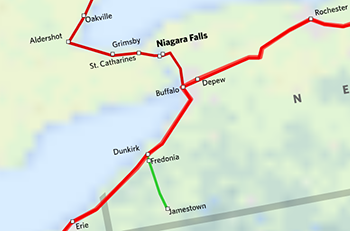 Build a rail tunnel connecting Rochester and Erie. Not only will this have the effect of silencing the "most expensive segment in the world" critics, but critical non-stop service between Rochester and Erie has never been more important according to our advanced ridership prediction models developed in a joint program by Harvard's John F. Kennedy School of Government and the Federal Railroad Administration and funded by the Amtrak Retirees Health & Welfare Fund. Moreover, an underground route will completely remove that pesky lake effect snow and its brutal effects on our timetables. We expect costs on this segment to easily exceed the Philadelphia Bat Cave project by a factor of at least 2.5x, for a total per mile cost of around $2.5 billion. Spread over 250 years this comes to a mere $1.43 billion per year or $175 million per mile per year. Next year we will unveil Phase II of this project, which will connect Buffalo to the 143 mile, underground Rochester - Erie line. The construction will also serve to protect (for a nominal annual subscription fee) upstate New Yorkers from rising Atlantic tides due to climate change. With interest rates near zero how can we afford not to invest in the underground foundations of our future? Disruptive technology and creative destruction are two key concepts in the Amtrak Way™. The site of the Aberdeen Proving Ground has long been an environmental and logistical nightmare immediately adjacent to the beautiful Chesapeake Bay. It only takes a few seasons of "The Wire" to understand the utility of converting Baltimore into a repository for the many tons of unused nuclear fuel that will be created from the many nationwide plant decommissionings to be prompted by our Phase III Environmental Study. In addition, simply expanding the Aberdeen Proving Ground to include Baltimore County would be an effective way of eliminating the ongoing problem of Baltimore and would provide our brave military with an urban and Chemical-Biological-Nuclear (CBN) training ground far more challenging than Mogadishu. Finally, the expansion of the proving ground would mandate the use of high speed (354 kilometers per hour) trains to avoid delivering an LD50 full-body dose of radiation on the Washington, D.C. - New York route. Much of today’s NEC rail infrastructure was built a century ago by visionaries whose work helped move a nation and propel us into greatness, and which we appropriated through years of influence peddling and lobbying. For America to be globally competitive in the coming years without sacrificing the Northeast corridor way of life, we must be equal to the challenges before us, and be daring to think big, planning for future growth and making the necessary investments and sacrifices in the region to support the centrally planned mobility needs for generations of Americans yet to come. At Amtrak, we are still in the early stages of this vital work but we are moving forward with dedication, commitment and a collaborative spirit in order to design and implement the NEC improvements that will serve the region and the nation for the century ahead. Statutory Stakeholder Feedback Notice: This document was made possible by removing taxpayers from the list of stakeholders. 1. 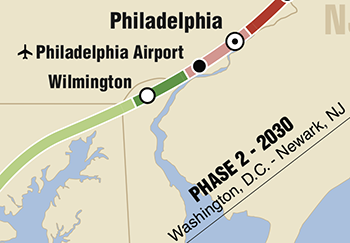 "Amtrak Vision for the Northeast Corridor," Amtrak (July 2012).